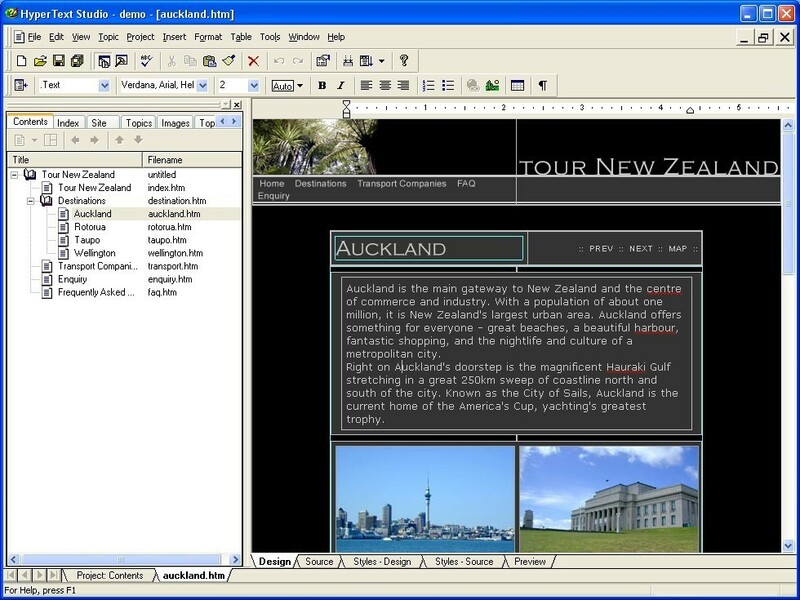 The HyperText Studio is a WYSIWYG Web site authoring tool that uses an Integrated Development Environment to visually develop your Web site. It has the same look and feel as other major Windows applications, reducing learning time. The WYSIWYG, HTML Source, Frame, ImageMap and Cascading Style Sheet editors let you create attractive and functional Web sites easily. Site and link management tools let you manage projects of any size effectively. Integrated site management and editor features make creating your content as simple as drag and drop. - Extensive support for HTML source code editing, such as code completion. The HTML Clean system lets you remove extra code in existing HTML pages created in other editors, including Microsoft Word. The HyperText Studio maintains your tags and attributes, ensuring the integrity of your data in both editors. - Topic styles let you apply common content to multiple pages. When you make changes to the topic style's content, The HyperText Studio applies those changes automatically to all pages that use that topic style. - Table drawing tools make creating even complex tables as easy as using a pencil and eraser. - The Properties Box gives you control over all aspects of your project, from individual characters and paragraphs through table layout, graphics alignment, and backgrounds. - Verify all links in your project with the built-in Link Checker. See all links into and out of a file with Link Management. - Manage your project graphics on one tab, replacing or inserting existing graphics. - Import existing HTML files, preserving the existing code. - Use Find and Replace to search for and/or replace content. You can replace text with other text, or add links or keywords automatically.